The Archives of the P.I. Nixon Medical Historical Library houses a collection of professional papers, research notebooks, and personal manuscripts of renowned, early 20th- century French physiologist Louis Lapicque. Born August 1, 1866, Louis Lapicque was a pioneer in the field of neural excitability. One of his main contributions was to propose the integrate-and-fire model of the neuron in an article published in 1907. This model is still one of the most popular models in computational neuroscience for both cellular and neural networks studies and in mathematical neuroscience. The Lapicque concepts of excitability and nerve transmission form a part of the basic framework of modern neurophysiology. Louis Lapicque completed his doctorate at the Paris Medical School. He married Marcelle de Heredia, one his notable students, on May 14, 1902. Their only son, Charles Lapicque, was born Oct. 6, 1898, before their marriage. Marcelle completed her doctoral studies under Lapicque in 1903, concentrating on the nerve impulse. Charles trained as an engineer but later gave up engineering in 1940 to become a painter. Lapicque and his wife worked closely together for nearly fifty years in the Sorbonne Laboratoire de Physiologie, publishing over 80 articles. They devoted their life work to the study of what they termed the chronaxie of the nerve – the nerve response over time under various physiological conditions. Louis held a professorship at the Museum d’Historie Naturelle and then at the Sorbonne. From the 1910’s to the late 1930’s, he was seen as the most important French physiologist of the time. Marcelle assisted him and was eventually named associate director of the laboratory. Professor and Madame Lapicque attracted and trained a host of pupils from France and many other countries, such as the United States and Japan. They were excellent hosts and well-loved and respected by their pupils. Together they brought physiology in France to world recognition. Lapicque’s interests were broad, but in later years he concentrated principally upon problems of excitation. He was also interested in history and published many articles about his deceased colleagues. Louis Lapicque was an ardent yachtsman and an accomplished navigator. He and Marcelle sailed across the English Channel to attend conferences in their yacht, rightfully named the Axon. His experience later proved beneficial during the occupation of France by Germany during World War II. Lapicque was imprisoned by the Gestapo for helping the resistance. During his three months’ incarceration, he authored his final book entitled La Machine Nerveuse, which was published in 1943 and in which he credited his wife with 40 years of collaboration, in addition to her own important individual research. Louis Lapicque died in Paris on December 6, 1952. Marcelle de Heredia Lapicque took over the directorship of the Sorbonne Laboratoire de Physiologie until her death in 1962. Held in the P.I. Nixon Medical Historical Library’s Archives, the Louis Lapicque Papers contain original handwritten lab books, journals of travel, a ship log for Lapicque’s yacht, manuscripts for papers, journal reprints, bibliographies of the research work of Lapicque and Alexandre Marcel Monnier, obituaries and biographical articles written by Lapicque and Monnier, and correspondence with both Lapicque and Monnier. For a detailed description of this collection, see the Guide to the Louis Lapicque Papers. The P.I. Nixon Medical Historical Library’s Special Collections owns a copy of Notice Sur les Titres et Travaux Scientifiques de M. Louis Lapicque. This volume published in Paris includes the original 1908 edition, as well as the two subsequent supplements from 1919 and 1928, all bound together. Its bibliographic listings reveal Lapicque’s extensive and wide-ranging scientific interests. To obtain more information or to access this collection in the Archives, contact Mellisa DeThorne, Special Collections Assistant, at 210-567-2470 or dethorne@uthscsa.edu. “Lapicque, Marcelle (de Heredia) (1873-ca. 1962).” The Biographical Dictionary of Women in Science, edited by Marilyn Bailey Ogilvie and Joy Harvey. New York: Routledge, 2000, Vol. 2: L-Z, pp. 745-746. “Louis and Marcelle Lapicque.” For Better or For Worse? Collaborative Couples in the Sciences, edited by Annette Lykkness, et. al. New York: Springer Basel, 2012, pp 66-67. “Louis Lapicque, 1866-1952.” J Neurophysiolog 16:97-100, 1953. 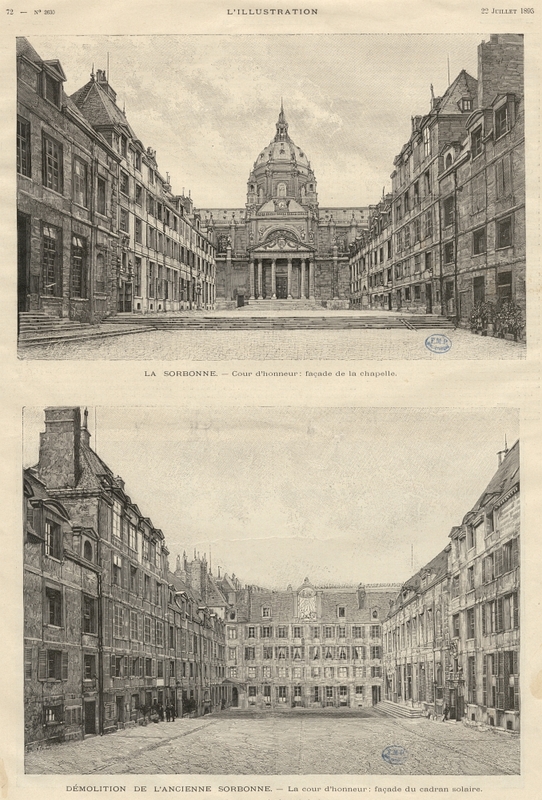 Illustration of La Sorbonne, 1893 is available under Licence Ouverte courtesy of La BIU Santé. Photograph of Louis Lapicque courtesy of académie Nancy-Metz. Photograph of Yacht, 1892 is in the public domain and retrievable from Wikipedia Commons.